A mosaic of the Huygens probe landing site, as seen by the descent imager/spectral radiometer (DIRS) on the Huygens probe. The mosaic is overlaid on a Cassini orbiter radar image, taken on an Oct. 28, 2005, flyby. 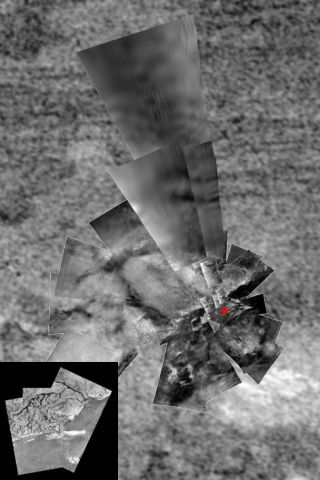 The landing site, marked by the red "X", is located in Titan's southern hemisphere. An oasis of liquid methane has unexpectedly been discovered amid the tropical dunes of Saturn's moon Titan, researchers say. This lake in the otherwise dry tropics of Titan hints that subterranean channels of liquid methane might feed it from below, scientists added. Titan has clouds, rain and lakes, like Earth, but these are composed of methane rather than water. However, methane lakes were seen only at Titan's poles until now — its tropics around the equator were apparently home to dune fields instead. Now near-infrared pictures of Titan from the Cassini spacecraft currently orbiting Saturn collected since 2004 suggest a vast methane lake exists on the surface in the moon's tropics, one about 925 square miles (2,400 square kilometers) large and at least three feet (1 meter) deep. A number of models of methane's behavior on Titan convincingly show that lakes are not stable at the moon's tropical latitudes. "Any liquid deposited in the tropical surface evaporates quickly and eventually is transported by Titan's circulation to the poles, where the large polar lakes appear," Griffith said. "This discovery was absolutely not expected," Griffith said. "Lakes at the poles are easy to explain, but lakes in the tropics are not." The researchers argue that these models of methane's behavior on Titan remain valid. The lake's presence during the moon's dry season several years before the arrival of seasonal tropical clouds and its long lifetime are evidence against it being a rain puddle, which would evaporate quickly. Instead, Griffith and her colleagues suggest this tropical lake is fed by subterranean channels, essentially making it an oasis in the desert. Past research has suggested that on average, about 3,425 pounds of methane per square mile (600 kilograms per square kilometer) must well up annually from underground of Titan's surface to explain the amount seen in Titan's atmosphere, since the gas is destroyed over time by solar ultraviolet rays. Past hints of subterranean methane breaking through to Titan's surface had also been suggested by data gathered by the Huygens probe that landed on the moon in 2005. "The landing site, although surrounded by a vast dune field, reveals a landscape carved almost entirely by three different liquid erosion events — rainfall, flooding, and seepage," Griffith said. "While rainfall may have carved the downhill drainage features, the flood plain, in which the probe landed, was caused by liquid flowing from a different source of methane. In addition, a puff of methane was detected upon landing, which suggests that the site was damp." The question of how a subterranean aquifer might form on Titan is still unclear. "Titan's orbit about Saturn might give us a clue. It is not circular," Griffith said. Some scientists suggest that Titan's noncircular orbit was once even more elliptical and only recently decayed to its current slightly noncircular orbit. During this possible orbital decay, the gravitational pull of Saturn on Titan would have led to powerful tides, releasing heat that could have caused subsurface reservoirs of methane to form and outgas. The scientists detailed their findings in the June 14 issue of the journal Nature.